In celebration of the new and improved noCRM.io QuickBooks integration, we’re bringing you this quick guide on how to get even more out of the service when it’s linked to your favorite lead management software, noCRM.io. Quickly. Ok, quick references aside, let’s take a closer look at QuickBooks. With QuickBooks, hundreds and thousands of small and medium-sized businesses (SMB) can manage their estimates, invoices and accounting tasks easily and securely. It is even possible to get paid directly through the site. There are no prizes for guessing that it’s the most popular accounting system with users in the United States. Sounds impressive, right? You’re probably already connecting the dots and can see why this integration is so useful to your daily workflow. 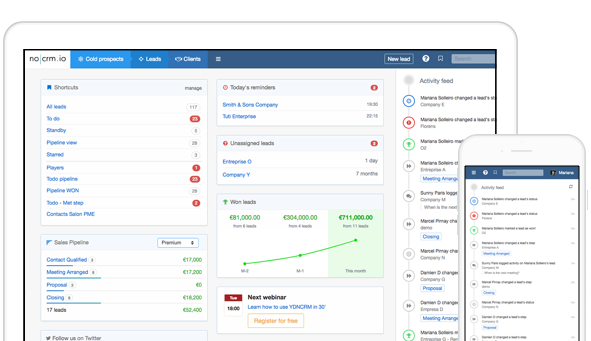 With noCRM.io, your leads are taken care of; with QuickBooks, you can create and add simple estimates and invoices where a lead is displayed. We like to keep things simple at noCRM.io, letting you focus on leads when using the service. Businesses often need to integrate software they use on a daily basis with multiple platforms, however. And Quickbooks is our latest link in a long line of apps that we partner with through our API. To sync QuickBooks to noCRM.io, simply go to the admin panel in your account and scroll down to the connect section. From there, click on the QuickBooks icon where you’ll find a connect to QuickBooks button on the right side of the page. Click on this and enter your login details for QuickBooks. Pretty easy, huh? But just in case you’re after a more detailed explanation, this step-by-step video guide will help. It includes how to connect, as well as all the latest features and how to use them. Check it out here. Talking of features, le’s go through some of them now. 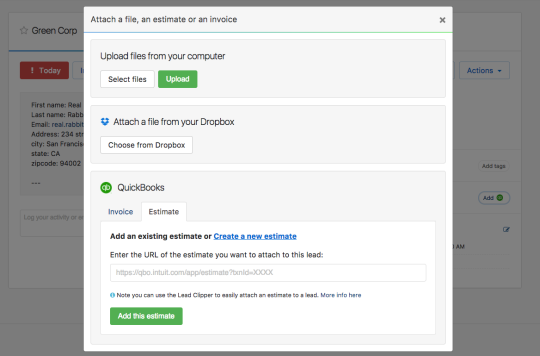 By integrating noCRM.io with QuickBooks, you can create a QuickBooks estimate or an invoice on any page where a lead is displayed. You can also add existing estimates. To do this, connect your account and install the Lead Clipper. Then go to a QuickBooks customer in the Quickbooks applications and click on the +Lead button. A popup window will appear asking you to either create a new lead or attach an estimate/invoice to an existing one. It’s as simple as that. You can now create new estimates and invoices or add existing ones in no time at all. Nice, easy and, most importantly, quick. For an even more detailed breakdown on how to use the features, visit our QuickBooks Help Centre Page. Now that you’re all synced up with QuickBooks, you can combine the best of both worlds: efficiently manage leads while creating estimates or invoices on any page where you can see a lead. Want more information on our integrations and how to use the service? Head over to our Help Centre. Get even more guides on how to use noCRM.io on the Academy page and with our video tutorials designed to help you get the most out of the service. Put our QuickBooks integration to good use, and manage your leads with ease. Sign up for a free noCRM.io trial today!